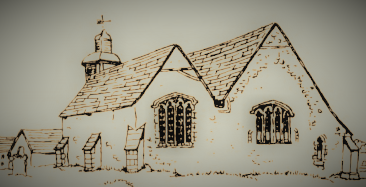 It’s always a good thing to think outside the box when graffiti hunting, as Alan Anstee of the Kent Medieval Graffiti Survey explains when he takes a look at All Saints, Murson. Since I started graffiti hunting with the Kent Medieval Graffiti Survey I have occasionally been asked to survey a specific building. In early 2015, I was asked to look for graffiti in the remaining fragment of the medieval church of All Saint’s, Murston, I hoped that there would be some graffiti. However, when I saw the scant remains of the church, which is believed to have been in existence by 1291, I expected little. but I soon found that neither would be the case, which I hope the following will explain. 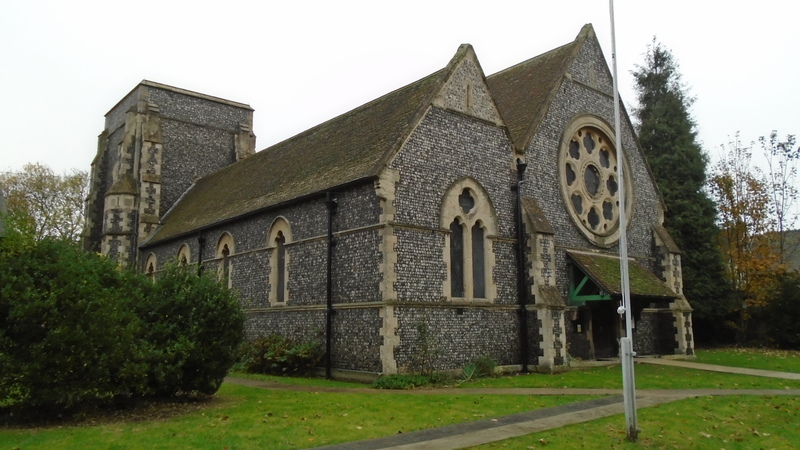 The village of Murston is now a suburb of the town of Sittingbourne, with the area around the Old All Saints church being entirely industrial, apart from the Football and Greyhound Racing Stadium next to it, while, the area around the New All Saints is largely residential. When I started to write this, I found that there is some ambiguity as to which part of the church this vestige was. Initially I was told that these remains were the centre of the chancel. I then found that the Historic England listing entry states that this was the south chapel, which is later than the main body of the church. However, on a closer inspection of the building, the existence of what appear to be blocked arches in both the north and south walls seemed to suggest that this might be the centre chancel. A drawing from the 19th century shows no windows or doors in the south wall of the chancel, see fig A, which seems to indicate that the extant wall was not the original south wall. I’m not an expert so will only present this information. 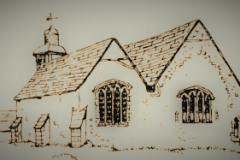 In part, because in the 19th century the population of Murston grew, the decision was taken to demolish the church and build a new one, as this increase in population made the existing church too small. Also, fumes from the nearby gas works and other industry affected the congregation and demolition eventually started in 1873. A small amount of reclaimed materials from the demolished church was used in the construction of a new church. This was also dedicated to All Saints and was built about half a mile away between 1873/4, one assumes at a safe distance from the fumes. The remaining section of the old church was converted for use as a mortuary chapel and used as such until about 1920. Although, plans exist to transform this building into a cultural and arts centre, at present it still stands empty but not entirely abandoned, see figs B & C.
Until I looked at the new church, I had believed that it would be pointless to look for medieval graffiti in a Victorian church. How wrong this church proved me! I had been told that two pillars from the old church had been used in the new one, however a feasibility study of the site’s development plan states that three pillars were used. This discrepancy may have occurred because the pillars were used, with new stone, to construct three pillars in the new church. As we do not know the original location of these pillars with any certainty, we do not know the context of the graffiti. All I was told was that they divided the chancel from the side chapels and Historic England state that they are 13th century. Today these form the arcade of the single aisle of the new church. However, as Hasted (1798) described the church as “… a large building of three aisles and three chancels”, there must have been more than two pillars in the church. 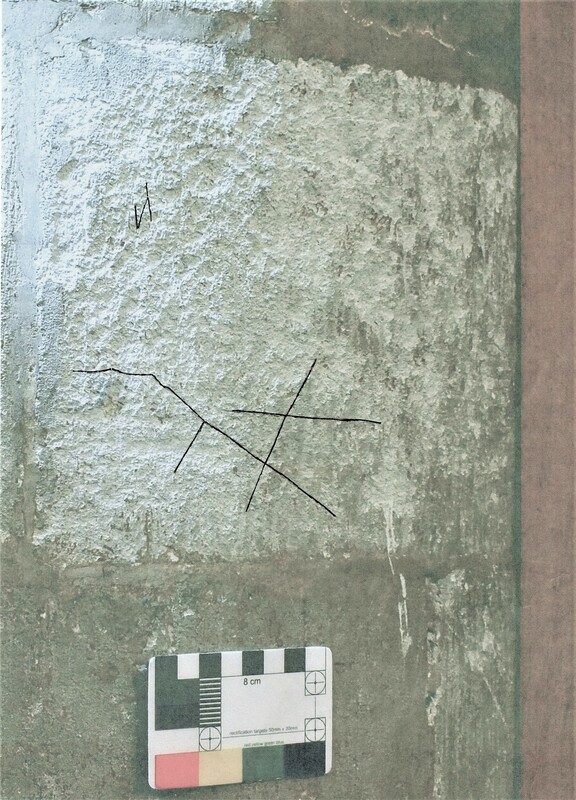 Although only these two pillars and other fragments were used, over thirty individual items of graffiti and mason’s marks were found. This graffiti seems to be at least pre-Reformation if not actually medieval in date. Given the above and the amount of graffiti found on the two extant pillars, it is likely that a similar amount of graffiti, as a conservative estimate, was lost in the demolition. Those found were fairly typical of what can be found elsewhere, although as the graffiti was on reused stone it was hardly surprising to find that some were upside down. The quality also was not dissimilar to what has been seen elsewhere, with one or two of the crosses being, perhaps the best of this assemblage. 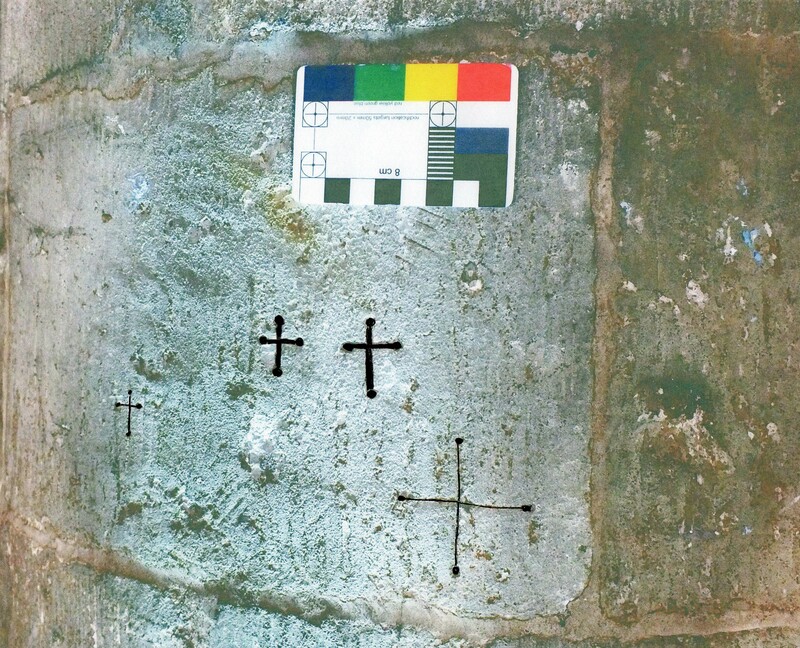 The graffiti consisted of masons’ marks, crosses, heraldic, apotropaic marks and some that could not be identified. The photographs below are grouped by type as above, crosses were the commonest, with at least sixteen being noted. These ranged from rough and quite crude to those which had been well executed with some care being taken. 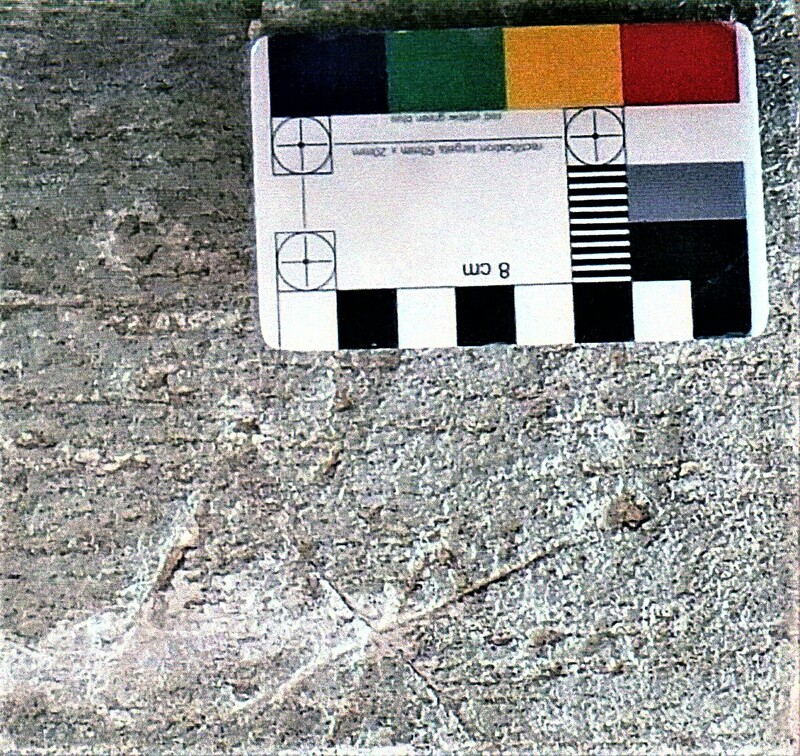 What are believed to be apotropaic marks were the next numerous with four possible marks found. These latter were varied, traces were found of possible ritual circles, meshes and crossing lines. Three probable masons’ marks were found, these all consisted of three crossing lines forming a star. It is thought these indicated which pillar they were to form part of. 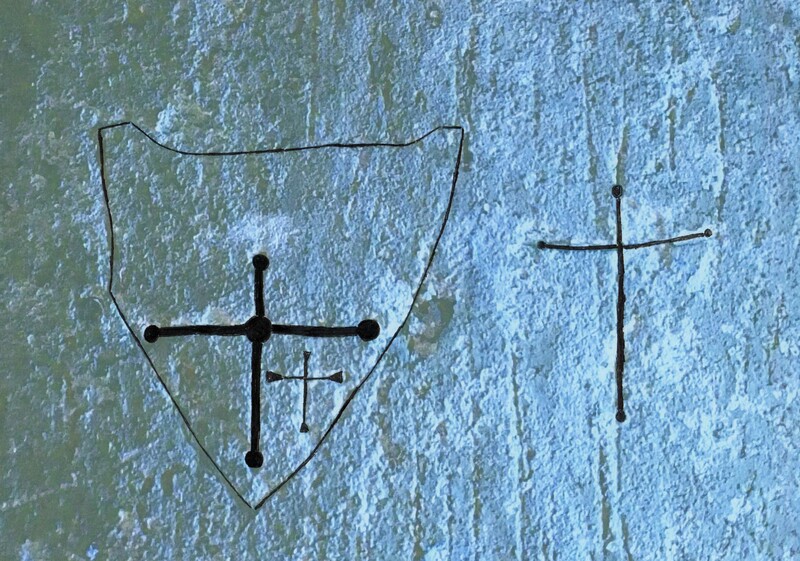 Only one heraldic mark was found, a shield with two crosses in it and another nearby. The unidentified graffiti consists of faint lines or what seem to be incomplete individual graffito. Even though these pillars are not in their original location and the graffiti is thus out of context, a full description of its present location is given. 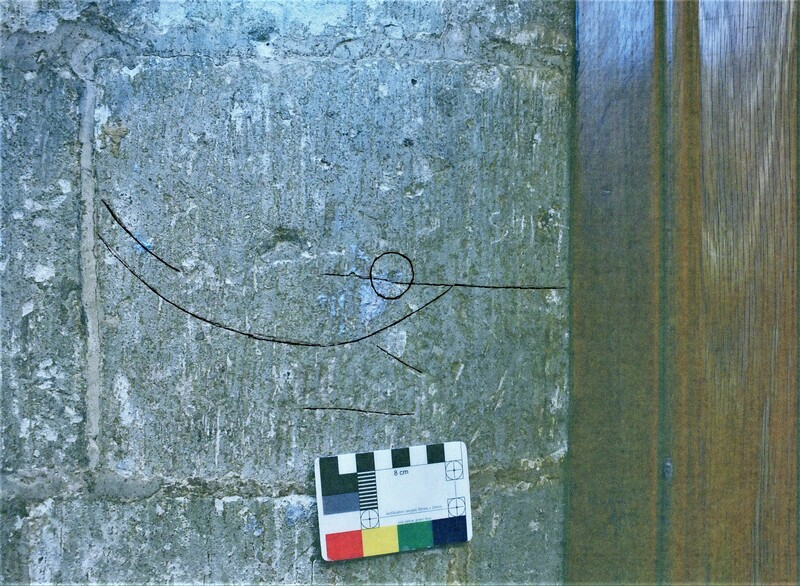 The graffiti believed to be apotropaic consisted of (No 1) a small circle set in what appear to be the faint traces of two arcs of circles. These latter are so faint that, an enhanced version (No 2) has been produced, even with this it was not possible to say if they were originally complete circles. These are on the northwest side of the centre pillar. Also on this pillar are two roughly parallel lines (No 3) crossed by another line. One of the parallel lines has a “loop” running through it from the bottom. 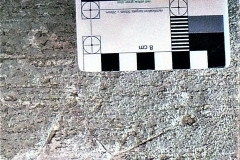 These though are on the northeast side of the pillar, as is (No 4), which consists of a mesh, which seems to have been eroded or partly removed. There also seems to be a small mesh on the southeastern side of the east pillar (No 5). 1) Centre pillar northwest side. A circle & two arcs of circles. 3) Centre pillar northeast side. Two roughly parallel lines crossed by another line. 4) Central pillar northeast side . A mesh & other marks. 5) Southeast side east pillar. A mesh on an upside down stone. 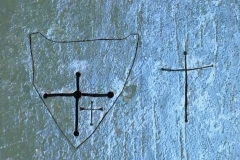 Crosses were found on all three pillars and were mainly in groups of three to five, if the three on and with the heraldic graffito (No 15) are included. Whilst on the southeast side of the west pillar (No 14) is a rough St Andrew’s Cross. Most though were found on the east pillar, (No 6) on the northwest side of this pillar consists of a single large St Andrew’s cross. On the southeast side of the pillar is an inverted stone (No 10) on which four crosses are inscribed. Due of the faintness of the crosses and the inversion of the stone an enhanced version (No 11) has been produced. Also on the southeast side of this pillar is another inverted stone (No 12) which has four faint crosses and a mesh on it. This again has had an enhanced version (No 13) produced. The central pillar had a stone (No 8) with five crosses, four of which are rough St Andrew’s crosses. 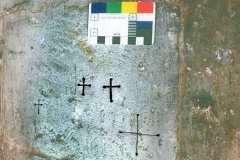 These had to be enhanced to show them well, however this photograph (No 9) showed that one cross, to the right and slightly above the top of the large cross, may be formed of part of an even fainter circle. 6) Northwest side of the eastern pillar. A St Andrew's Cross. 7) Centre pillar side. Five Crosses. 8) Centre pillar south side. No 7 enhanced. 10) Southeast side, east pillar. Four crosses on an upside down stone. 11) No 10 Enhanced & the right way up. 12) Southeast side east pillar. Four crosses & a mesh on an upside down stone. 13) Southeast side east pillar enhanced. No 12 enhanced & the right way up. 14} West pillar southeast side. 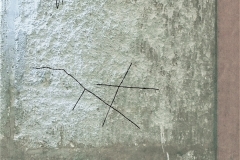 A rough St Andrew's cross. The lone piece of heraldic graffiti (No 15), is on the northwest side of the central pillar, is a shield on a piece of inverted stone, it has a relatively large cross in it and another fainter one under the right arm of the main cross. There is also another faint rough cross alongside the shield. This group of graffiti has also been enhanced (No 16) and presented as it was originally inscribed. 15) Northwest side of centre pillar. 16) No15 enhanced and turned the right way up. The three mason’s marks found were identical, three crossing lines forming a sort of star. hey are all on the central pillar and possibly indicate the pillar they originally formed part of. One (No 17) is on the northwest side, another (No 18) is on the southwest side and the third (No 19) on the south side. 17) Centre pillar south side. Star Mason Mark. 18) Centre Pillar northwest side. Star mason's mark. 19) Centre pillar suthwest side. A mason's mark & other marks. On the northwest side of the eastern pillar is an eroded or damaged stone (No 20) which at first glance has a very faint St Andrew’s cross on it. When the picture was enlarged and looked at closely two other lines were seen. This was enhanced (No 21) but showed nothing of any significance. There are marks on the northeast side of the eastern pillar (No 20) which look deliberate but these few lines make little sense. At the base of the centre pillar east side on the Victorian stone is a circle (No 21) which may be natural or just a mark made by accident but which it was felt should be recorded. There are faint indecipherable lines (No 22) on the northeastern side on the eastern pillar. 20) Eastern pillar northwestern side. Various lines. 22) Eastern pillar northeastern side. Some odd marks. 23) Centre pillar east side. A rough circle on Victorian stone. 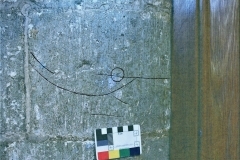 There is one old graffito in the old church (No 27) a letter I on the south door pillar, which is shown enhanced (No 28). The south wall has several examples of modern graffiti (No’s 24 & 25). There are also the remains of, what seems to be, a medieval wall painting (No 26). 24) North wall modern graffiti. 26) North wall, a fragment of wall medieaval painting. I hope this has shown four things: firstly, never assume that the ruins of a church will have some old graffiti; secondly, never assume that a rebuilt church will have no graffiti; thirdly always read the listing record it may, as in this case, tell you that reused stone has been used or that part of the original fabric still exists; finally, even a fragment of a medieval church can give an idea of what graffiti was there, especially of other evidence indicates what was originally there.